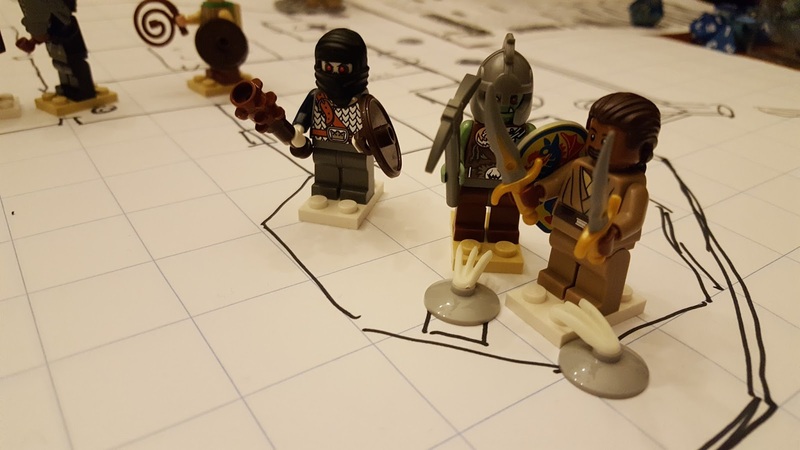 As the caravan moved on with its walking wounded, the wizard Fatou and the cavalier ZhaZha studied the sky and predicted that a sandstorm would come through this area the next day. The bard Edel recalled a stony ridge near their route back to Zahallan that would provide much better shelter than the endless dunes, so the band headed that way. The next day, the caravan reached the stone ridge. Lucretia's sharp eyes soon spotted a portico carved into one of the larger outcroppings. The PCs went ahead to investigate as the drovers continued to move the pack animals that direction. The small, columned portico had once been covered in carvings, but most of the details were either chiseled away or eroded by the desert and time. There was no obvious entrance from the portico itself, but a stone door could be seen to the right of the columns. The rogue Jubair examined the door, found no traps, and opened it. Unable to see far inside, he let the half-orc inquisitor Jumari explore in his stead. Inside was a small, empty tomb whose wall murals had been defaced to the point of being almost impossible to make out. A small alcove on the far side held a shattered coffin and much unidentifiable debris. Meanwhile, the others searched the shaded area among the columns. Fatou spotted a venomous snake hiding under a piece of fallen rock, so she stepped away before zapping it with a force bolt. That angered the serpent, but it slithered away to hide elsewhere. The monk Lucretia found a secret door in the center of the carved wall. This led into a long gallery which sported two murals on the longer walls. Jubair, Edel, and Fatou joined her in investigating this space, while ZhaZha stayed outside with her camel. One mural showed the military exploits of a warrior in distinctive armor. Jubair thought that this person must be Gorza, a hero among the local orcs and half-orcs. The opposite wall showed robed figures ambushing and murdering this warrior, then dismembering the corpse in a gruesome ritualistic manner. Fatou recognized the ritual black robes and some of the gory details as belonging to the death god Asmolon's cult. About this time, Jumari rejoined them by finding a secret door linking the empty tomb with this hallway. 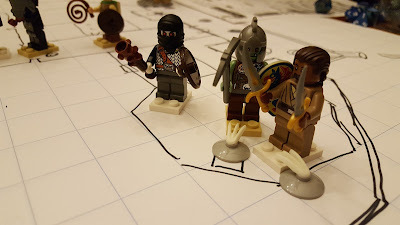 The party paused here to inform ZhaZha and the rest of the caravan about what they had found. 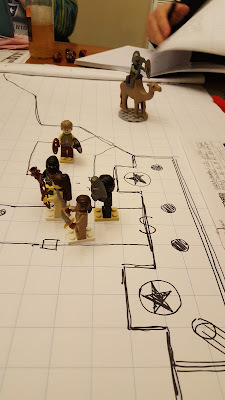 The half-orc cavalier tied her camel to one of the columns outside and went in to see the gallery for herself. She didn't recognize the imagery, but did know Gorza's name, explaining that he was considered a hero in her home village (though she seemed reluctant to say more about her own past). Beyond the gallery, Lucretia and Fatou found a room with walls blackened by paint and soot. On the far wall stood a dais, on and around which were strewn shards of obsidian. Fatou concluded that this was once a shrine dedicated to Asmolon, but that someone has shattered whatever cult icon once stood here. Edel hung back so that he could provide light with his cantrips. Meanwhile, Jumari led Jubair and ZhaZha through a door off of the gallery. This led to a series of small storerooms filled with decaying furniture and containers. The first room contained two flying severed heads, which attacked ZhaZha and Jubair but were easily obliterated. In the second storeroom, Jubair found a box in better condition than the other stores, but heard the sound of moving coins inside. ZhaZha smashed open the box with her pick, and two mummified hands sprung out to attack her and the rogue. These animated claws inflicted some minor wounds, but were unable to grasp hold of their targets before being destroyed. After encountering so many ambulatory body parts, the trio were now paranoid about what use the rest of the bodies had been put to! Lucretia and Fatou investigated the other door off of the gallery, which led to a chamber containing four skeletons, which attacked. Fatou's force bolts and Lucretia's arrows quickly downed a couple of them, but one of the surviving undead mauled Lucretia, knocking her unconscious. 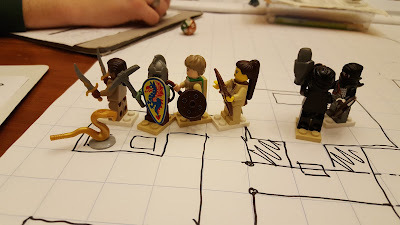 Edel healed her while the other half of the party rushed to the scene to help finish off the skeletons. The combined group then finished exploring the storerooms. 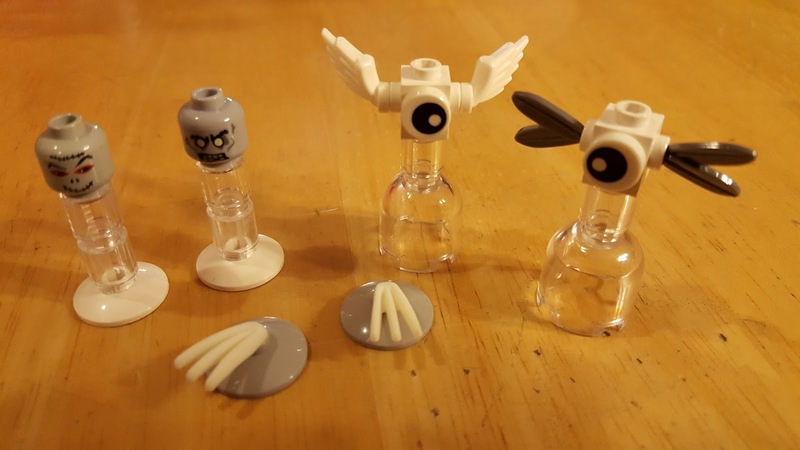 The last one contained a pair of animated eyeballs that trailed nerves that formed spindly wings. These creatures sprayed fluid at Jumari (who resisted) and Fatou (who dodged), then closed to attack. 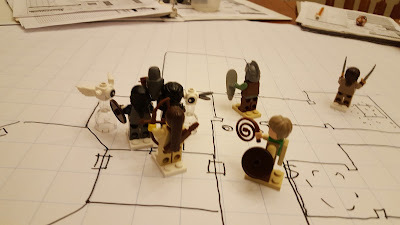 Lucretia impaled one with an arrow, while Jumari cast disrupt undead to finish off the other. (Fatou noticed that when Jumari cast her spell, the red birthmark on her face flushed a darker color, but the wizard failed to grasp the significance of that effect.) In this last room, the party found a small coffer holding silver coins, and a case of masterwork bowyer's tools (which Lucretia was very pleased to claim). 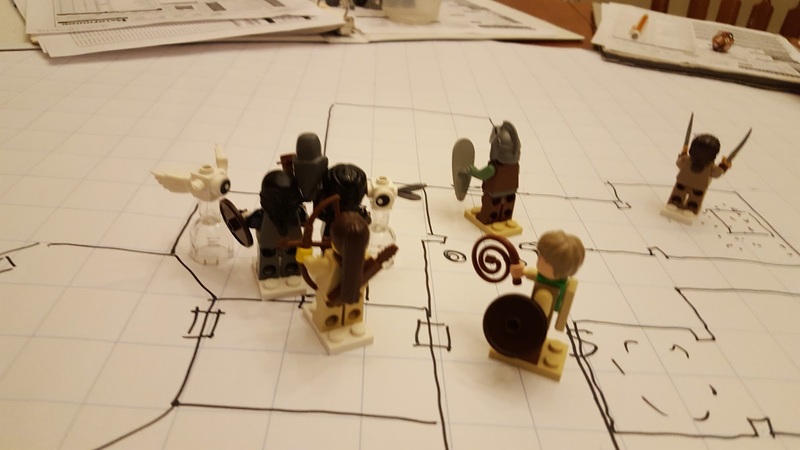 The party searched the storerooms more thoroughly, and located an everburning torch, which was given to Fatou since she is a spellcaster who rarely uses weapons. 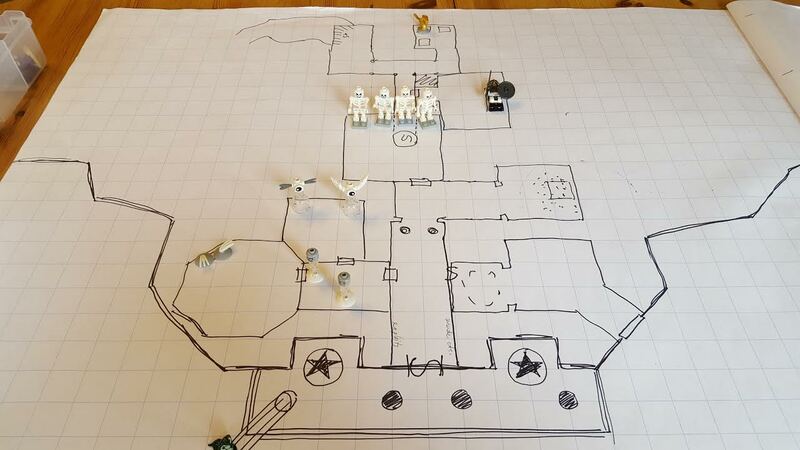 They also searched the skeletons' chamber, where ZhaZha found a secret trapdoor down to a second level. The party paused here to inform their boss that this level of the complex was clear, which meant that the rest of the caravan could lead the animals inside and take shelter now. Below the trapdoor was a short corridor that led past a door then split into two passages. The door led to a room containing an armored skeleton laid to rest upon a stone bier. The body began to move, but Fatou zapped it with magic and Jubair charged and stabbed it before it could attack. ZhaZha and the rogue then finished it off as it tried to stand. This gave the party their finest loot since entering the tomb: a breastplate, shield, and longsword, all of masterwork quality, and a magical amulet. Edel determined that the amulet was a protective item, and the party all agreed that Jubair needed it most. Jumari requested the breastplate, and ZhaZha took the sword and shield. The bier bore an inscription identifying the deceased as a champion of the Lord of Endings (Asmolon). 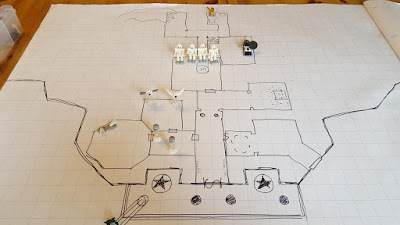 One branch of the passageway led to a room where a cave or burrow had broken into the worked stone room, but the opening was five feet or so above the floor, so the party decided to put off exploring this direction for now. The other branch took them to a small treasure room where Jubair spotted the movement of an articulated metal snake. This iron cobra bit and poisoned him. The venom's damage made the rogue fall unconscious, but Edel soon revived him. The magical snake proved to be difficult to damage, but Fatou's force bolts slowly wore it down, and ZhaZha's great strength finished it off when she finally managed to connect with it. Jubair tried to use his roguish skills to extract any remaining doses of poison from the defunct construct, but only succeeded in poisoning himself again. Jumari thoroughly smashed the remains before he could try again. The treasure room contained three chests. The first held gold coins. The second held a divine scroll (blood biography) and a pile of documents containing unholy texts of Asmolon's cult. Jumari claimed the scroll, and wanted to destroy the blasphemous writings, but Fatou insisted on keeping them for study in order to better understand their enemy. The third chest contained a longbow that had been preserved with an unguent of timelessness, as well as an unused pot of the same substance. Lucretia claimed the bow, as she had been trying to save up money for a better weapon; this one was not masterwork, but would let her make full use of her strength. While she and the spellcasters examined it, Jumari noticed the name "Gorza" inscribed on the bow in Orcish. The ambulatory body parts: beheaded (Bestiary 4), crawling claws (Bestiary 2), and isitoqs (Bestiary 4). Us, so we sought a place to remain hale. As we found both a clear and secret door. The other led deeper beneath the sand. Remained where I could keep both under eye. While two against some skeletons did strive. While other stepped up to destroy them all. Were put to rest 'fore we were further harmed. Whose armor and venom did make us quake. Though rogue twice felt the viper's poison bite. Edel's player has finished composing his verse about this session, so that has been appended to the post.